In July 2015, Alliance for Truth about Comfort Women sent its second overseas delegation to Geneva, Switzerland to participate at the pre-session meeting of the United Nations Committee on the Elimination of Discrimination Against Women (CEDAW) and to lobby at the United Nations Educational, Scientific and Cultural Organization (UNESCO) against the inclusion of Nanking atrocities and comfort women in its Memory of the World Register. 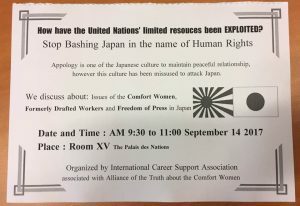 Delegation member Mio Sugita successfully obtained an opportunity to speak to the CEDAW to dispute the historical orthodoxy of comfort women by using the UN consultative status of International Career Support Association, which has become a vehicle to promote Japanese historical denial at the UN level. 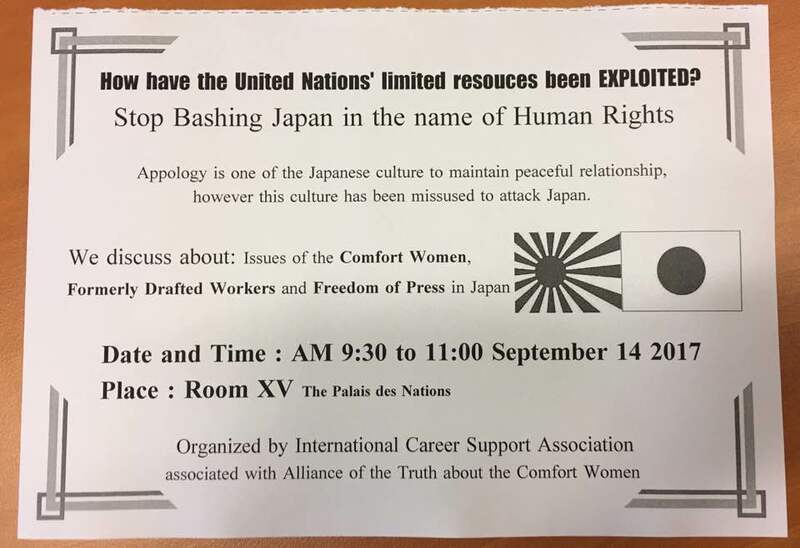 In June 2017, Alliance for Truth about Comfort Women and its affiliated groups sent its delegation to Geneva, Switzerland to attend the United Nations Human Rights Council, taking advantage of the UN consultative status of the International Career Support Association. 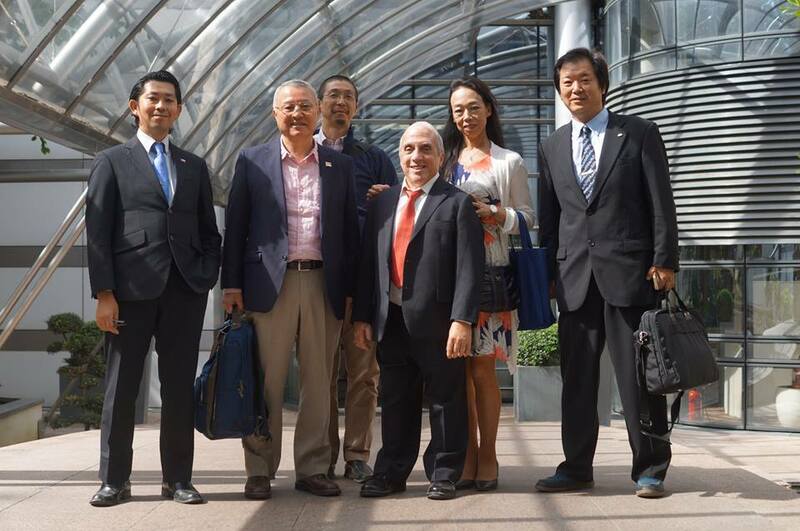 Mitsuhiko Fujii of Rompa Project (Happy Science) spoke at the meeting demanding a re-evaluation of the 1996 report by the UN Special Rapporteur Radhika Coomaraswamy. In March 2017, Alliance for Truth about Comfort Women sent its fifth overseas delegation to Geneva, Switzerland to dispute the historical orthodoxy of comfort women at the United Nations Human Rights Council (UNHRC). At the UNHRC, Tony Marano (a.k.a. Texas Daddy) gave a speech on behalf of the Alliance, taking advantage of the UN consultative status of the the International Career Support Association.